A fabulous looking cat. The photograph was taken by Kathrin Stucki who owns and manages A1 Savannahs with her husband Martin. She has a photographic studio amongst the cats. This is very convenient if you want or need to do cat photography, which is a part of the business for Kathrin. I love the focused, wild looking face and strong gaze, directly into the camera. The high contrast spotted coat and that brown pigmentation on the bridge of the nose are also stand out features for me. Is that a sign of a wildcat heritage? I am not sure but I see it on a lot of wildcat hybrids, and some random bred cats too. On a technical note and photographically speaking the photograph is slightly unconventional. Helmi Flick, the famous cat photographer, uses a short telephoto lens (say about 85 mm on 35 mm format). This flattens the perspective a little and is considered ideal for portraiture, which this is. 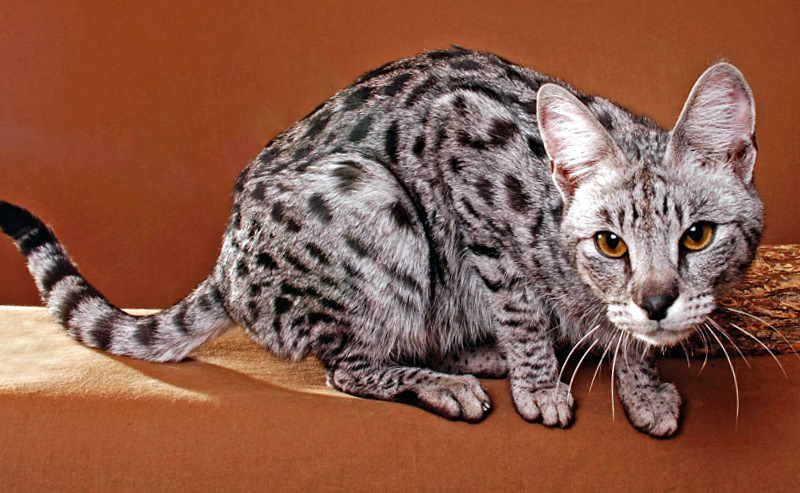 In this photo of a silver F1 Savannah cat the focal length of the lens is standard or probably slightly wide angle. This results in the head being large in relation to the body as it is nearer the camera. It does provide a great immediacy and connection with the viewer but in terms of classic portraiture it is not conventional. You can see the rangy body and long legs reflecting the serval parent. The serval has the longest legs to body size of all the wildcats including the cheetah. This entry was posted in Cat Breeds, Savannah Cat and tagged Kathrin Stucki A1 Savannahs Photos, savannah cat, savannah cat photos by Michael Broad. Bookmark the permalink.